What if someone made a movie of your life? Would you be happy with the choices you made, with the path you took? The Farm is an intentional spiritual community in Summertown, TN, that sprouted from 1960s Haight Ashbury hippie culture and grew into America’s largest commune. It was founded on the ideals that people could all get along, live with less stuff, share land, and make a better world. Most were baby boomers, the children of parents who were shaped by the Great Depression and World War II, and whose primary drive was to provide stability, affluence, and a comfortable life for their children. I took that comfort for granted, as it seemed to pale in my pursuit of consciousness, inner peace, creative expression, and community connection. So that’s why I and 300 mutually curious and ambitious spiritual seekers felt inspired to follow Stephen to create a different, alternative society. We tried to elevate the meaning and purpose of performing the daily tasks of living into the zen of being “householder yogis.” We honored that the path of maintaining a home, marriage, family, and community was as challenging as the path of a monk meditating in solitude in a cave or on a mountaintop braving the elements. Through sheer commitment—to what we thought was a way to improve the world by changing first ourselves and from there helping others—mixed with a healthy dose of youthful idealism, we accomplished a lot as young adults in our early twenties. Our efforts pioneered and contributed to the soy, vegetarian, midwifery, back-to-the-land, collective living, and grass roots international aid movements—and they continue to this day. The belief and standards we had on The Farm that people can decide to change themselves and create a more whole and sustainable world and quality of life is at the root of my coaching and healing practice. 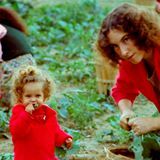 American Commune, by my filmmaker daughters, Rena Mundo Croshere and Nadine Mundo, is a documentary feature film that chronicles the rise and fall of The Farm and tells their personal story of what it was like to be born and raised there and then adjust to modern society when our family left. The film also traces my life, Jewish roots, marriage, and why I and others dropped out and opted for an alternative lifestyle. It’s a very intimate and moving portrait of those of my generation who chose that path and the “second generation” who were born into it. This weekend American Commune will have two screenings in the Bay Area at the SF Jewish Film Festival: Smith Rafael Film Center in San Rafael, 8/10 Saturday matinee (2 pm) and Oakland Grand Lake Theater 8/11 Sunday evening (6:40 pm). Don’t miss it! LMK in comments here if you go and how it was for you.